You have to eat at Zunzi's! Sure, Savannah is widely celebrated for rich Southern cuisine, but one of my favorite dining spots in The Hostess City offers an eclectic mix of international dishes and not a fried item on the menu. 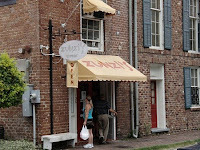 Please don't misunderstand, I do love fried Southern goodness, but Zunzi's is not to be missed. It is open until 6 PM and is located on the corner of Drayton and Whitaker. I love the falafel sandwich, which is served on a pita with wonderful tzatziki sauce. The African Tea is the perfect way to quench your thirst, you must try it! Zunzi's offers only outdoor seating and expect a line at the counter. Everything on the menu is delicious, reasonably priced and the owners are a delight. This entry was posted on 4:13 PM and is filed under Savannah , Zunzi's . You can follow any responses to this entry through the RSS 2.0 feed. You can leave a response, or trackback from your own site. That sounds delicious; one of my favorite things to eat is falafel! I've never been to Savannah, but when we go, I'll remember your suggestion! I haven't been to Savannah yet, but if I go I will keep in mind your recommendation. Thank you! I have eaten there, it was great. I would go again and again!